We now have all l our coins back from VSS with images and we are adding them to the web site now. We have been a little slower than normal but will be caught up this month. Then we are on to more submissions. Our goal of 1,000 coins in our study group is basically done on the acquisition side. Actually we have 1,064 but they are not all graded and VAMed. But we will get there in the coming months. There is one coin in the first submission that will need LVA examination when possible. This is our continuing look at VAMs 1H, 1J, 1K, 40, and 20. Of particular interest has been the emission sequence, die cracks, and this month a look to see what physical characteristics would prove that this is the same physical die. What we cannot confirm yet is that there are no others in the sequence. These five VAMs also have three different die designations (1, 27, and 12) which may or may not be deserved. We have continued the discussion and repeated the analysis to date at the bottom of this page. For better or worse, while waiting on the coins from PCGS we opened up a new study outside the Morgan Dollar world. Right now we are working to secure the remaining copyright approvals, but this is timing only. So why am I delving into in this other study? Well as a child I used to ride by the Stone Mountain Memorial with my father on trips to Atlanta. Neither of us thought it would ever be completed because of the repeated failures and just the magnitude of the task. Obviously we were wrong and the Stone Mountain Commemorative Half has always had some interest in my collecting arena. This is a big study with some discoveries about the process and the coin, and I will post a link here and on VAMworld when it is up and going. Since I started this web site I have had more than one occasion where I thought I had located a set of double denticles on coins. I learned a lot about ejection errors and what those look like and I believe was told repeatedly that no verifiable example of true double denticles has ever been located. Well a funny thing happened on the way to the current analysis a the bottom of this page. I was checking for details on coins to find links and suddenly realized that on a VAM 1H I was staring at a set of doubled denticles. They spanned almost the top twenty-five percent of the coin, but I also realized that I needed confirmation. I learned in the die work that VAMs 40 and 1H share a die in the same state and as luck would have it these are two of our most common VAMs. We have nineteen mint state VAM 40's, and seven mint state VAM 1H's. So there was plenty of material to work with, and there they were. 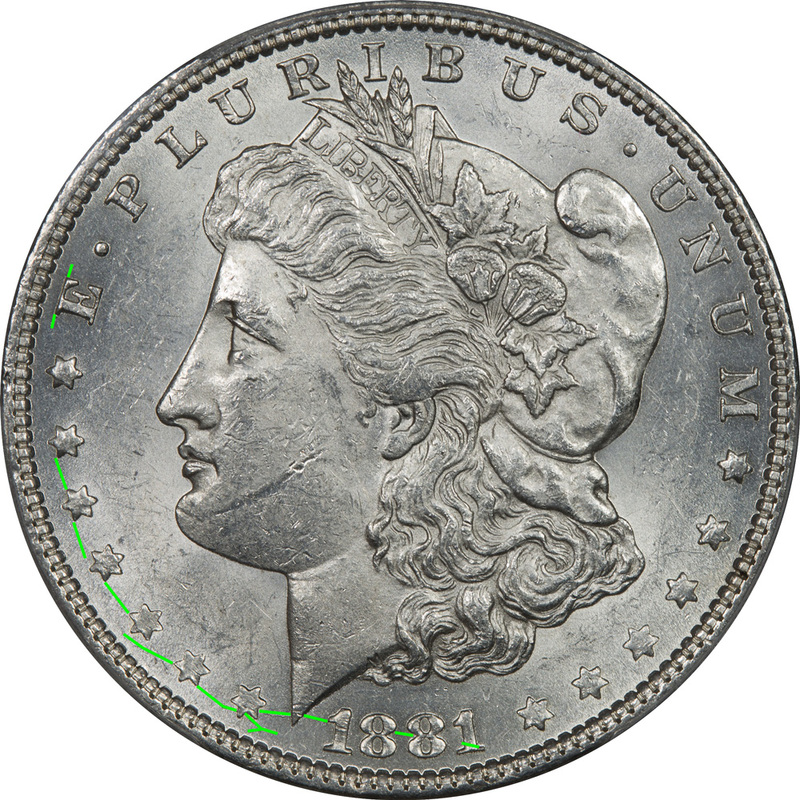 All twenty-six coins have the same denticle doubling in exactly the same placement. They don't photograph well, but I am learning with my microscope and can probably do more images later. Obverse Die 12 when paired with a specific Reverse Die a forms VAM 20 - Doubled 18. We have several examples of VAM 20 for study, so there is lots of material in different grades. Emission sequences are new for us and therefore we need verification of this work. But we see a clear delineation of the die use into before and after the repolishing, with VAMs 20, 1J, and 1K coming first and in that order. Then we believe the die was pulled from service and polished to try and save it, put back in service only to have it fail again. On that second round the sequence of use was VAMs 40 and then 1H. It is possible that VAM 1I is in this sequence but we need more evidence to confirm that addition. To try and determine if all three VAMs came from the same physical die we decided to examine two of our highest graded coins for each VAM. In the Case of VAM 1J we have only one example, and with VAM 1K we unfortunately have none. But we will fill these in over time. To try and determine if the dies used were in fact the same we examined three areas other than die crack similarity that we consider unique, one of which may be a surprise. 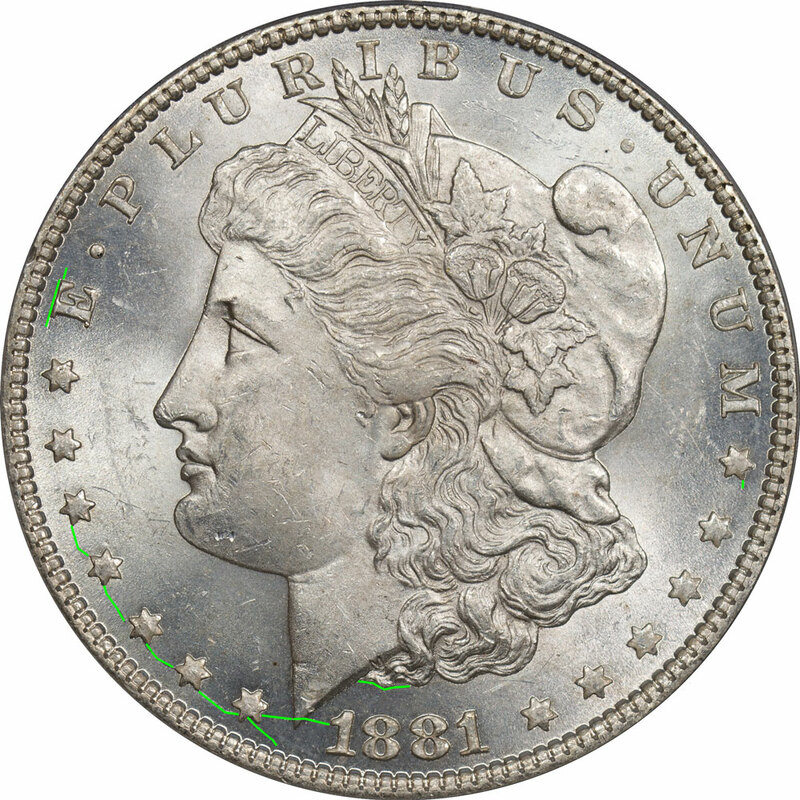 The obverse features included the inner ear, the LIBERTY Headband, and the mouth. Please keep in mind we are only looking for similarities in the Obverse Dies. Also, please keep in mind that we believe the emission sequence is 20, 1J, 1K, 1H, AND 40. so there should be differences, but progressive differences. Looking at these photographs it seems apparent that the inner ear matches with VAM's 20 and 1J, and also matches for VAM's 1H and 40. The earlobe could be a match for all four. There are two features of note on coin 19925080 and these are two horizontal lines on the inner ear and a small doubling of the earlobe. The inner ear lines are only present on this coin, but the other is an MS60 and the strike might not be full in this area. VAM 1J also has the same die scratches on the inner ear and the same doubling of the earlobe. This is coin 84368570, an AU58 example. This is our only example of VAM 1J. VAM 1H does present a different story. The lines are not present and we believe most of the pitting has been removed from the die through polishing. But there are two little pitting marks or dots in a specific place that are identifiable. This is coin 25655639, an MS65 example. The images for VAM 40 match so closely to the ones for VAM 1H that they could be clones. The same two dots that are present on VAM 1H are still there, and the earlobe doubling is the same. 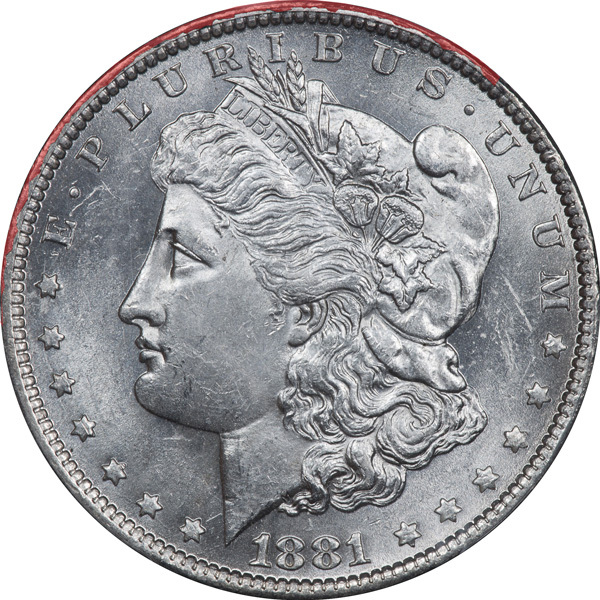 This is an image of coin 81802246, an MS64 example. Liberty's headband is always a good place to look, so our second analysis went there. When we look inside the TY there are several polishing lines that run diagonally through both letters. These are on coin 19925080. VAM 1J also has the same polishing line in the TY and in this picture you can see that there is a slight bit of doubling, but it is more like what we think of as Longacre doubling where the letters are stepped down around the perimeter of the letters. The doubling is present on the VAM 20 but does not photograph well. This is coin 84368570, an AU58 example. This is our only example of VAM 1J. VAM 1H is where we believe there is a repolishing transition, and if so then this may be a good indicator. In the TY all the polishing lines are gone except for the bottom of the Y. We cannot say that they are an exact match, but they are directionally the same. This is coin 25655639, an MS65 example. The images for VAM 40 match so closely to the ones for VAM 1H that they could be clones. But there are some stronger polish lines that could be the transition between 20, 1J, and then 40. If that is correct then it might be that VAM 40 came before VAM 1H in the sequence. This is an image of coin 81802246, an MS64 example. And then I had an accidental discovery that links all four VAMs. There is a chip missing out of the bottom left side of the letter T. This same chip is missing on all four VAMs. So this may further tie the four together into one physical die. Often for us a good PUP is the clutter in the mouth. Like other features this can be unique to a die. There is a bold and distinctive pair of lines toward the front of the lips. These are on coin 19925080. VAM 1J has the same lines in the front of the mouth. This is our only example of VAM 1J. VAM 1H is where we believe there is a repolishing transition. Now the lines are gone. This is coin 25655639, an MS65 example. Like others in this analysis, the images for VAM 40 match so closely to the ones for VAM 1H that they could be clones. The lines at the front of the lips are gone. This is an image of coin 81802246, an MS64 example. We thought we had the emission sequence all nailed down as 20, 1J, 1H, and then 40. But a funny thing happened on the way to the denticle tail above. We found this coin. We have a significant number of VAMs 40 and 1H and we were checking the denticles for duplication. Then we ran into this coin, a VAM 1H and it has extensive rim damage that we do not believe the die could have recovered from and gone back into service. So we need to assume that use of the die ended with VAM 1H. With all this in mind we think the correct sequence is 20, 1J, 40, and 1H. 1K probably fits in there somewhere but that will need to come later when we acquire one.